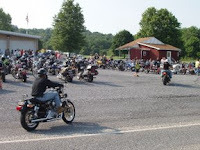 June 17th was a beautiful riding day -- sunny and temps in the 70s -- as I hit the road around 0630 for a nice 80 mile ride (click for my route sheet) thru the boonies to Lawn, Pennsylvania, a tiny burg not far from the chocolate heaven of Hershey. 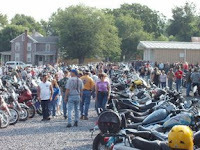 The Lawn EMS & Fire Co. hosts a ride-to-eat event for motorcyclists every 3rd Sunday from June thru September, beginning at 0700. (Click here for event details). You'll find the Fire Co. on twisty PA Rte. 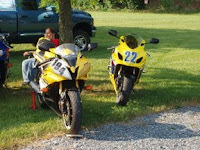 241 between the towns of Gretna and Elizabethtown. From my observations, "Lawn" is quickly gaining popularity. Similar (though maybe 20% as large) to the Ephrata "First Sunday" event, all manner of riders and motorcycles show up, though Ephrata still brings out the rarest, wackiest and weirdest machines. Lawn EMS does a great job organizing the event and always has personnel directing the incoming bikes into the 2 fairly tight parking areas -- paved to the left (fills up early) and gravel to the right (bring a sidestand plate!). 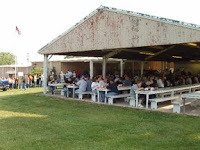 The food is much better and varied than at Ephrata and the covered pavilion is welcome protection from both rain and sun. If you're planning to eat, show up early to avoid waiting in long lines. The outdoor country setting overlooking the expansive grassy grounds is particularly conducive to long, relaxed consumption of mass quantities. After chowing down, the order of the day seems to be catching up with riding buddies, making new ones, and of course: oogling the bikes!